Dentist Missouri City: You Need Regular Dental Checkups! Maybe you have been neglecting your dental checkups or don’t think you really need to see the dentist unless you have a problem. Your dental health is an indicator of your overall health and well being, and dental checkups are extremely important. Read on to find out why regular checkups are so important, and how they can keep your teeth, gums, and whole body healthy! The kind of clean that a dental hygienist gives you is so much more detailed than one you can get at home. Even if you are brushing and flossing regularly, tartar can build up on your teeth and lead to cavities. Tartar, mineral buildup, is scraped off of your teeth with metal instruments, something that is not safe to try at home. Your hygienist might also use high pressured water to clean under the gums. After a professional teeth cleaning your teeth will feel amazing! This cleaning can identify areas of your mouth that you need to focus on with your own brushing and your hygienist can give you tooth brushing tips. Another important aspect of regular dental checkups is getting periodic x-rays. X-rays are painless and only take a few minutes but can give you a valuable look deeper into your oral health. X-rays could reveal impacted wisdom teeth, whether you need a root canal, or if there are other jaw bone issues you need to address. X-rays can also look at your bite and how your teeth are affecting your overall facial structure. X-rays are important for looking below the surface and are also valuable for tracking your dental history. 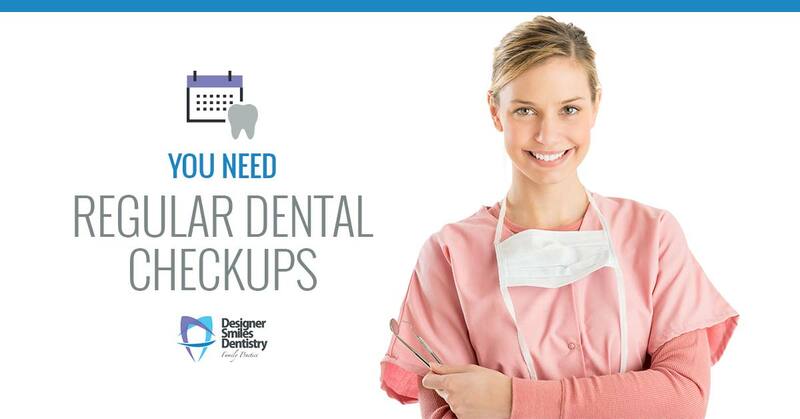 You won’t need x-rays at every dental checkup. Your dentist will give you a thorough exam and ask you if you have had any tooth sensitivity, pain, or other chewing or biting problems. Your dentist will look for early signs of tooth decay and advise you on treatment options if there are signs of cavities. Catching dental caries early is crucial, and they are much less expensive to fix when they are small. Your dentist will evaluate any cracks or chips in your teeth and let you know if they think that you need a root canal or a crown. Your dentist will also check your gums for early signs of periodontal disease or oral cancer. The earlier that oral cancer is detected the better the chances of stopping the spread. Your dentist will also assess your bite and any jaw issues that you have. Another great reason to keep up on your regular dental checkups is to talk about your treatment options for cosmetic concerns. Your dentist can not only keep your teeth healthy, they can also help you get the smile you’ve always wanted. Whether you want to discuss options for tooth whitening, you want a straighter smile and want to talk braces, or you have heard about Invisalign® and are wondering what it’s all about, your dentist will be able to give you your cosmetic options. One great option for easily correcting tooth shape, color, and spacing is to use veneers, that can quickly give you that smile you have always wanted. If you have lost teeth your dentist can discuss whether dental implants could be a good choice for you. Your dentist is there for your dental health and also for all of your cosmetic concerns. Another great reason to visit the dentist regularly is to get all of your dental questions answered. Your dentist can help you understand your treatment options, recommend a toothbrush and toothpaste, and help evaluate your dental habits. Chewing on ice, pencils, or hard candies can all damage your teeth and your dentist can help you understand how bad they really are for you. Your dentist can help you try to break habits such as thumb sucking in your children before they impact tooth placement, and can advise you on healthier alternatives to sugary drinks and sodas. Your dental checkup is your chance to ask all of the questions you have had about your teeth and gums and learn more about how to have excellent dental hygiene. Your dentist will most likely also do an assessment of your head and neck and look for any abnormalities. Enlarged lymph nodes and swelling can indicate a deeper problem, and a bad bite can lead to TMJ problems. TMJ can make chewing very painful, so catching the early signs of a poor bite can help alleviate problems later on. Keeping your regular dental checkups also help you keep an ongoing relationship with your dentist which can prove helpful if you ever need emergency care. Many dentists won’t take new emergency patients, so unless you have already established yourself as a patient you will have to wait. Finding a dentist you like and trust before you have any major issues will help you quickly get the help you need if you ever have a dental emergency. If you are looking for a great dental clinic in Sugarland, Missouri, or Stafford Texas, Designer Smiles Dentistry is here for you! We handle everything from dental restorations and emergency dental work to cosmetic dentistry that can help you smile again! If you haven’t had a dental checkup in quite a while, or if you are experiencing dental pain or any other problems, Designer Smiles Dentistry would love to help—schedule an appointment today!